Audience not rolling with it. 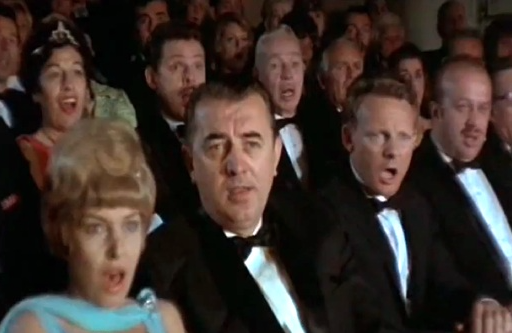 The woman in the front row seemed to appear to be doing, in the words of Woody Allen, “literally anything else.” It was hard not to take personally the stare suggesting that just watching my act was the equivalent to having a rat cage strapped to her face. I’ll put it this way: whatever she was expressing it wasn’t passive indifference. And then her husband did something I’ll never forget: he patted her on the knee. Not my most impressive moment. It was the needlessness of it that ate at me. Life onstage isn’t like life – it is life. After “de-greeting” the audience I approached them with my apologies. I forget exactly what I said but I didn’t do to badly, I have to say myself. What moves audiences are the same things which move them – us – in everyday life: mastery, generosity, the unexpected. Similarly – no, in exactly the same way – audiences recoil at unkindness, sloppiness and card tricks. Right and wrong do not recognize the fact that you “have the floor”, as it were. I resolved to apologize to the woman and her husband after the show. Fortunately the couple was among the stragglers at the end of the show and at my soonest opportunity, after “de-greeting” the audience I approached them with my apologies. I forget exactly what I said but I didn’t do to badly, I have to say myself. Anyway, they’re both very nice and were very gracious. I learned they had flown out that day from San Jose, where they live. Then I noticed that the woman had every over-the-counter cold medication you’ve heard of laying there in her lap. She was a CVS with ears. Hence the evident difficulty hearing me: she had a nasty cold, made worse by a day of air travel. Anyway, I shook their hands and left re-committed to this tendency of me in certain situations to personalize things. My internal dialogue onstage should have gone like this: “What’s with this woman? Can’t she mock something less than contempt for 45 minutes?” which I then answer “How the hell should I know why she can’t do it. I can’t even figure out how the toaster works. Besides, what difference does it make? She was minding her own business and, as I said, not a distraction to anyone until I decided to make her a distraction to me. One lesson here is that nobody knows what the hell anybody else is going through in their lives. How often have you met someone who appears to be the embodiment of success in life but you barely have to scratch the surface to learn that, for example, his wife has MS. Sure, most people seem to hold it together pretty well but so do you and we both know you’ve got problems. “To live is to suffer” wrote Dostoyevski. (Dostoyevski was a compulsive gambler while Tolstoy a vegetarian, which gives you an idea of why Dostoyevski had so much more fun). Who the hell am I to pretend to know what the hell is going on in somebody else’s mind? These people I can barely see but who practically form a dialogue with me through their laughter. (I think comedy as a dialogue: the audience has a line every ten seconds or so and when they miss a cue it’s always my fault). Whenever you find yourself thinking “Gee, this gal’s got it made”, don’t be so sure. Life has everybody figured out. Everybody. Roosevelt said “We have nothing to fear but fear itself”. It would be well to add “We have nothing to feel sorry for ourselves about, as others share greater burdens”. Return to daviDDeeble.com or watch me deal with a 3-year old heckler. 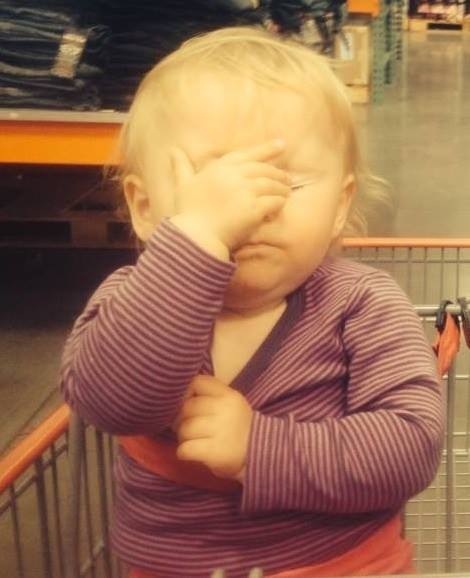 Face-Palm – Even kids get it. What the point? One is to not be too harsh on yourself. “Slow learner” is not the same as “bad person”. Hold yourself accountable for your actions, by all means, but be humble knowing that better people than you have failed similarly. You are not alone. But the more important lesson is that act of searching for happiness tends to foster and even induce happiness. This is why the U.S. Constitution says “the pursuit of Happiness” instead of “happiness” – they are two sides of the same coin.